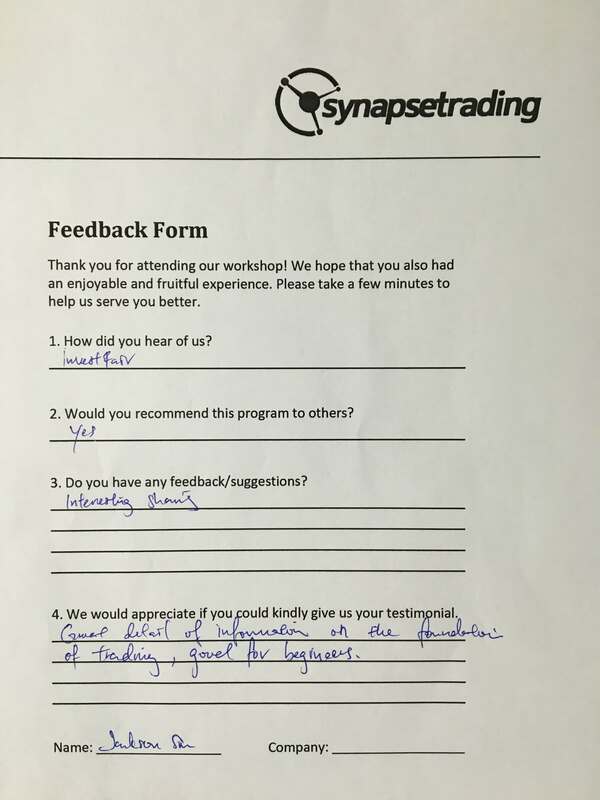 More Results & Positive Reviews for our “Trading Foundation Workshop” – Last Run is Next Week! Thank you everyone for attending my “Trading Foundation Workshop” last night, and I was surprised to see such a large crowd despite the recent Zika outbreak. ✌️ I had a great time conducting this 3-hour 5-part training, and imparting all the essential skills for new traders and investors to get started in the financial markets. ? I was also glad to have time to log in to my live trading accounts to show my current trades, and make some new trades along the way. 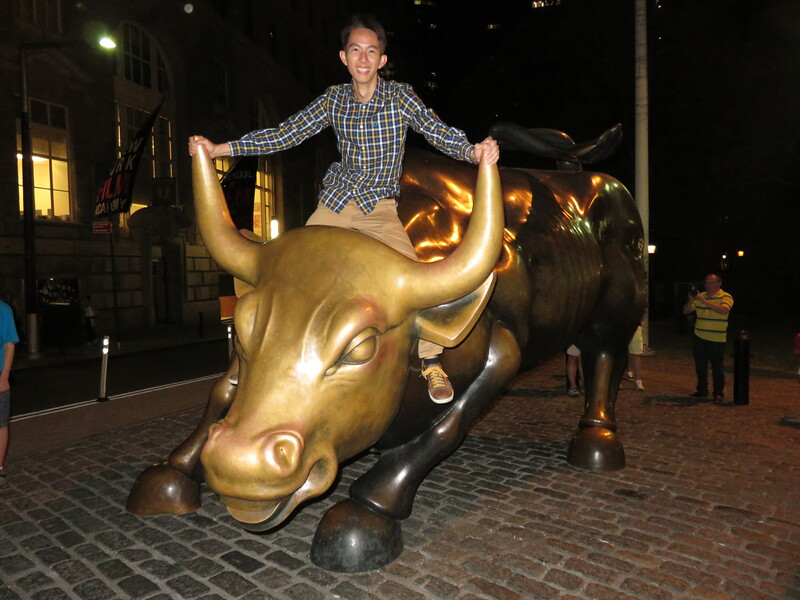 I believe that real trading is still the best way to learn. ? I will be conducting one last session next week on 07 September 2016 (Wednesday), and I think there are still a handful of seats left, so do grab yours before they are all sold out! ? Once again, seats are filling up fast, so sign up via the link below, or contact us at 97724280 for reservations or enquiries. Thanks, and see you there! ? https://i1.wp.com/synapsetrading.com/wp-content/uploads/2016/09/2016-09-01-20.46.42.jpg?fit=2048%2C2048 2048 2048 Spencer Li http://synapsetrading.com/wp-content/uploads/2014/03/logo-header1.png Spencer Li2016-09-04 04:30:072016-09-04 04:30:07More Results & Positive Reviews for our "Trading Foundation Workshop" - Last Run is Next Week! Another Full-house Session for the “Trading Foundation Workshop”! 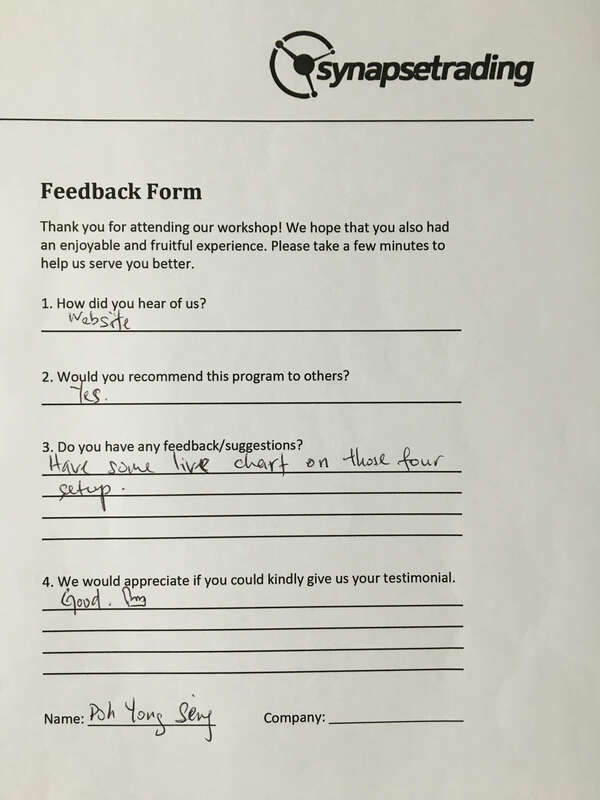 Thank you everyone for all the great feedback for this 3-hour “Trading Foundation Workshop” that I created to help new traders and investors get started in the markets! ??? 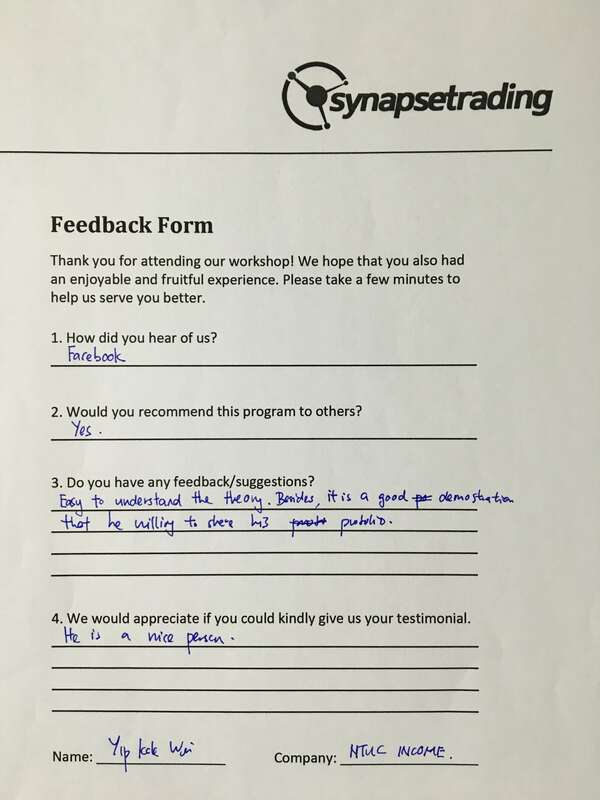 We just concluded a session last Wednesday, and we will be having our second last session next Wednesday on 31 August 2016.
https://i0.wp.com/synapsetrading.com/wp-content/uploads/2016/08/Photo-24-8-16-9-39-06-PM.jpg?fit=3264%2C2448 2448 3264 Spencer Li http://synapsetrading.com/wp-content/uploads/2014/03/logo-header1.png Spencer Li2016-08-27 18:36:102016-09-07 15:12:49Another Full-house Session for the "Trading Foundation Workshop"! 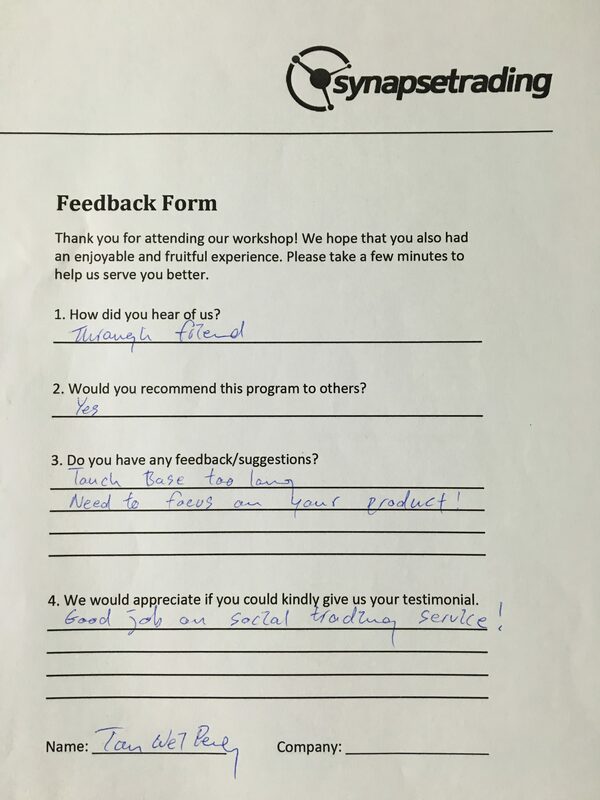 “Trading Foundation Workshop” Raving Reviews + Weekly Trading Results! 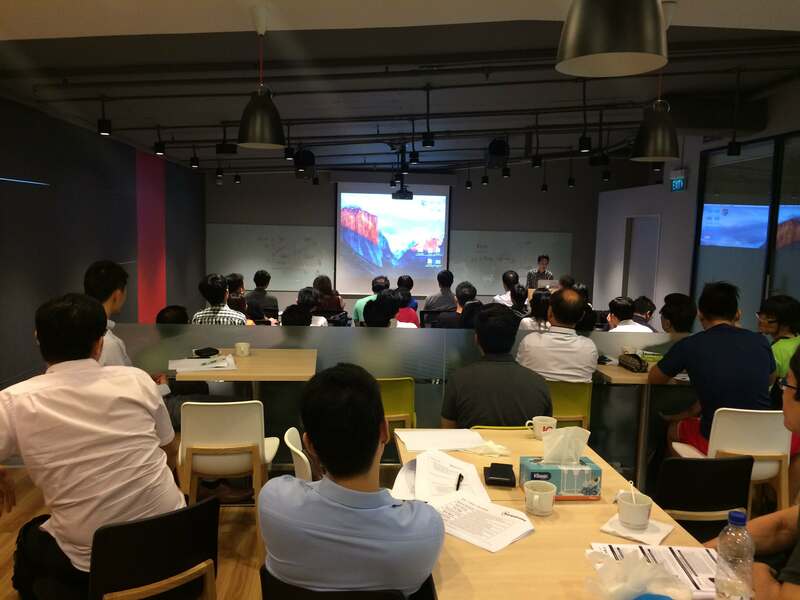 Thank you for another more-than-full house turnout for the 2nd run of the “Trading Foundation Workshop“! ? It was so full that some people decided to sit next to the pantry to enjoy the free flow of drinks. ? In light of such strong demand, we will be holding a 3rd run next week, so if anyone is keen to get started on trading or investing, do reserve your seats early before it gets all snapped up! 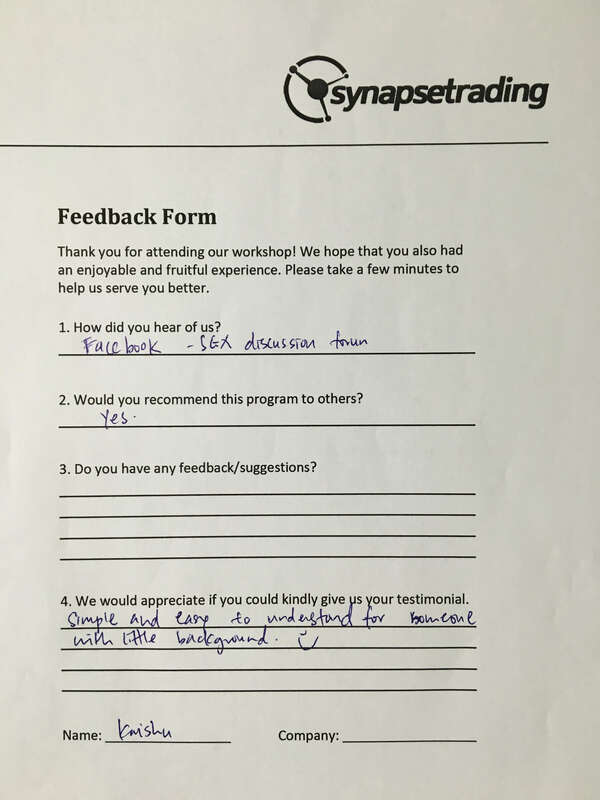 It was no surprise that almost 100% of all attendees said that they would strongly recommend this value-for-money 3 hour intensive training workshop to all their friends and family, especially those who are keen to get started in their trading or investing journey. Once again, for those who are keen to see why this new workshop has been generating such good reviews, do reserve your seat early to avoid disappointment! 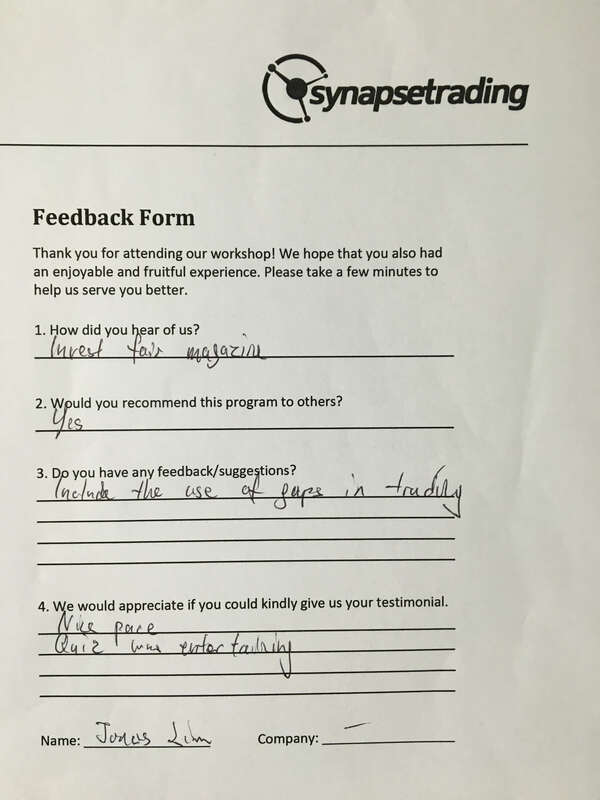 https://i2.wp.com/synapsetrading.com/wp-content/uploads/2016/08/Photo-16-8-16-8-47-42-PM.jpg?fit=3264%2C2448 2448 3264 Spencer Li http://synapsetrading.com/wp-content/uploads/2014/03/logo-header1.png Spencer Li2016-08-21 05:08:012017-02-12 19:53:51"Trading Foundation Workshop" Raving Reviews + Weekly Trading Results! Full-house Turnout for Our First “Trading Foundation Workshop”! Thank You! 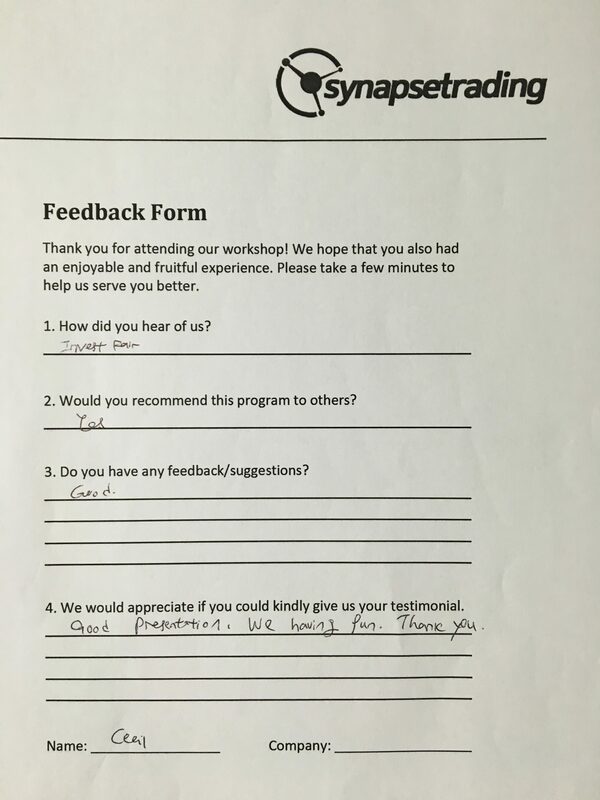 Yesterday, we conducted our first “Trading Foundation Workshop”, and the response was simply incredible! Due to overwhelming demand, and many attendees who wanted to invite their friends and families, we will be running it a few more times, so that everyone can have a chance to kickstart their trading journey, especially those who are new to the markets. And the best part is that every participant got to take part in the BONUS QUIZ and win up to $500 worth of prizes, and also take home a “Customized Trading Plan”, in addition to all the printed slides and training materials. For those who are keen to join us for the next session, there are 4 seats left at the moment, so do reserve early to avoid disappointment! 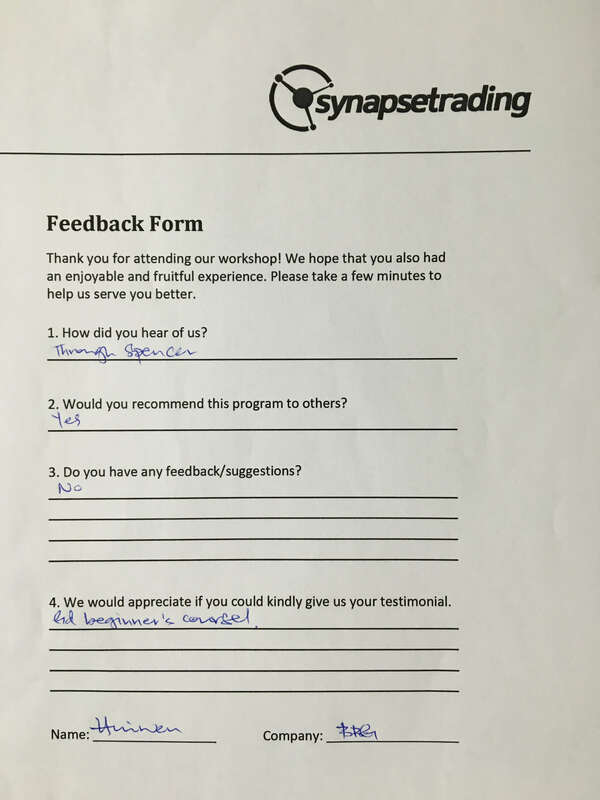 https://i1.wp.com/synapsetrading.com/wp-content/uploads/2016/08/Photo-11-8-16-21-44-24.jpg?fit=3264%2C2448 2448 3264 Spencer Li http://synapsetrading.com/wp-content/uploads/2014/03/logo-header1.png Spencer Li2016-08-12 20:08:192016-08-31 04:56:07Full-house Turnout for Our First "Trading Foundation Workshop"! Thank You! Shorting the S&P 500 – Potential Trade of the Year? I am referring to the trade on the S&P 500 short, which we started accumulating positions about 2 weeks ago, and will continue to find pullbacks to continue shorting. There will definitely be up and downs in this trade, as you can see from the previous instances, that the trade will not simply move one way all the time. Hence, I will be monitoring it on a daily basis to capture its swings, while capitalizing on its downward bias. https://i0.wp.com/synapsetrading.com/wp-content/uploads/2016/05/2015-08-04-10.11.42-copy.jpg?fit=4608%2C3456 3456 4608 Spencer Li http://synapsetrading.com/wp-content/uploads/2014/03/logo-header1.png Spencer Li2016-05-06 19:41:302018-10-30 12:36:36Shorting the S&P 500 - Potential Trade of the Year?